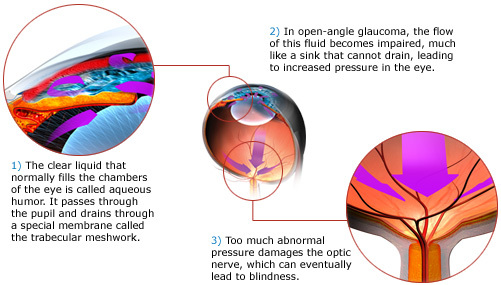 Glaucoma is the progressive damage to the optic nerve due to high intraocular pressure (pressure in the eye). The damage to the optic nerve results in gradual loss of field of vision. If untreated, tunnel vision occurs. Eventually even the central vision can become lost, causing blindness. The intraocular pressure becomes elevated when the aqueous humor (natural fluid in the eye) is unable to drain out of the eye in the normal manner. Disruption to aqueous outflow can be due to disturbances at the level of the trabecular meshwork (open angle glaucoma) or due to physical obstruction at the anterior chamber drainage angle (angle closure glaucoma). Regardless of the mechanism of raised intraocular pressure, the goal of treatment remains the same: the reduction of intraocular pressure. By decreasing the intraocular pressure, further optic nerve damage can be prevented or at least slowed down. In the normal eye, aqueous humor is produced at a rate of 2 to 3 microliters per minute. Any obstruction at the anterior chamber drainage angle (angle closure) or dysfunction (and obstruction) of the trabecular meshwork (open angle) means that the rate of aqueous drainage will be less than the rate of production. This results in build up of aqueous fluid and elevation of the intraocular pressure. In those with open angles, there is no physical obstruction at the anterior chamber drainage angle. This means that there is nothing preventing the aqueous humour from reaching the trabecular meshwork where it ought to drain out of the eye. So why does the aqueous still build up in the eye and cause elevated eye pressures? This is because it is the trabecular meshwork itself that is the problem. Consider the trabecular meshwork to be a sieve that allows the drainage of aqueous. If this sieve is not working properly (dysfunction) or clogged up (obstruction), then no fluid will be able to pass through. In trabecular meshwork dysfunction, the cells just do not work as well as they normally do. This becomes more common with age (primary open angle). This can also occur after blunt trauma to the eye (angle recession) and with the use of steroids (steroid-induced). - Age over 40. The older you are, the higher the risk. Trabecular meshwork obstruction occurs when there is accumulation of material in the trabecular meshwork, causing it to become clogged up. Clogging up of the meshwork reduces the amount of aqueous that can drain out of the eye. This can occur from blood cells, pigment and inflammatory cells. Treatment is aimed at lowering the intraocular pressure. This can be achieved with eye drops, laser or surgery. If applicable, the root cause of trabecular meshwork dysfunction or obstruction should also be treated. For instance, if there are blood cells or inflammatory cells in the eye, then treatment with eye drops with anti-inflammation action will help. If the high pressure is steroid-induced, then stopping the steroid will help bring the pressure down. In those with angle closure, the aqueous is unable to reach the trabecular meshwork. In angle closure, the iris becomes pressed against the cornea. This obstructs the access to the trabecular meshwork thereby preventing aqueous from draining from the eye. The image above demonstrates the difference between open angle (left) and angle closure (right). In angle closure, the space between the cornea and the iris is obliterated. This physically prevents the aqueous from reaching the trabecular meshwork, and causes intraocular pressure build up. So why does this occur? There are 4 main factors that contribute to angle closure: pupil block, plateau iris, lens-related and posterior segment-related. Pupil block develops when aqueous is unable to pass from the posterior chamber to the anterior chamber at the level of the pupil. The resulting build up of fluid in the posterior chamber pushes the peripheral iris against the cornea, thus causing angle closure. This is illustrated above (bottom picture). Plateau iris occurs when the ciliary body is enlarged or rotated forward; this presses and pushes the peripheral iris forward. Lens-related angle closure is when the increase in lens size pushes the entire iris forward, causing the angle to close. Finally, in posterior segment-related angle closure, a mass (such as tumour, cyst, inflammation or bleeding) at the back of the eye pushes the lens and the iris forward, thereby closing the anterior chamber drainage angle. 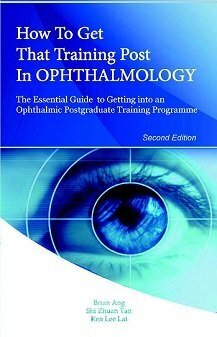 As with open angle glaucoma, the aim of treatment is to lower the intraocular pressure. In addition, it is also important to open up the anterior chamber drainage angle, i.e. re-open the closed angle. The first line treatment for angle closure is laser iridotomy which creates a full-thickness opening in the border of the iris. This allows aqueous to flow directly from the posterior chamber to the anterior chamber without going through the pupil, thereby relieving any pupil block and opening the angle. Sometimes additional procedures are required to re-open the angle; these include laser iridoplasty, cataract surgery, vitrectomy and glaucoma surgery. Laser peripheral iridotomy is the creation of a 'hole' in the iris (white arrow) which allows aqueous to flow from the posterior chamber to the anterior chamber. It is mandatory for all patients with angle closure. This laser relieves pupil block and reduces the risk of developing acute angle closure glaucoma (see below). 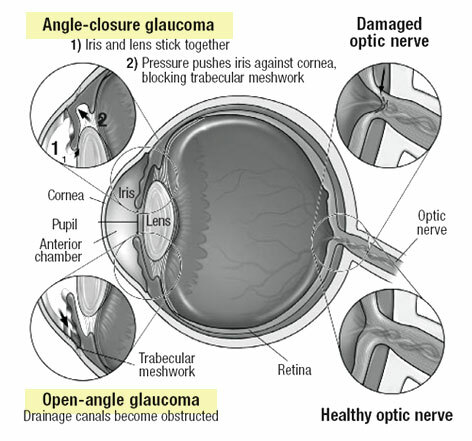 Acute angle closure glaucoma or acute primary angle closure occurs when the anterior chamber drainage angles become completely occluded and aqueous fluid is completely unable to drain out of the eye. The eye pressure becomes elevated to extremely high levels (usually higher than 40 mmHg). This causes severe headache, eye pain, nausea and blurring. This is an ophthalmic emergency - if you experience these symptoms, consult your ophthalmologist immediately so that the appropriate treatment can be administered. If left untreated, the optic nerve will become irreversibly damaged and cause glaucoma blindness. 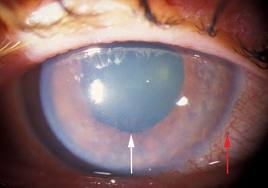 The tell-tale signs of acute angle closure are a red eye (red arrow), mid-dilated pupil that does not react to light (white arrow) and a cloudy cornea. 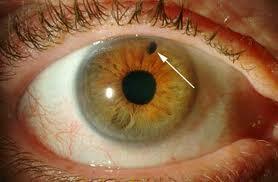 The cornea is cloudy due to build up of fluid in the corneal tissues from the high eye pressure. The aims of treatment are to lower the eye pressure rapidly (with eye drops, tablets and possibly an injection into your vein) and to re-open the drainage angle (with indentation, laser iridotomy and possibly laser iridoplasty). If treated early enough, it can usually be brought under control within a few hours. As the eye pressure reduces, your eye will feel more comfortable and your vision slowly recovers. Having a laser iridotomy should usually prevent you from having another episode. Usually your ophthalmologist will also recommend that you have the laser iridotomy on your other eye because there is a high risk that it will develop the same problem. In the rare cases where the acute angle closure recurs despite successful laser iridotomy, laser iridoplasty or even surgery may have to be performed. HOW DO YOU DIAGNOSE OPEN ANGLES AND ANGLE CLOSURE? To confirm whether your anterior chamber drainage angles are open or closed, your ophthalmologist will perform a special examination called gonioscopy or a scan called anterior segment optical coherence tomography (AS-OCT). In gonioscopy, a special contact lens is placed on the front surface of your eye after your eye has been numbed with anesthetic eye drops. This contact lens or goniolens allows direct visualization of the anterior chamber drainage angle. Your ophthalmologist may need to apply some pressure onto your eye during this examination. Don't worry, this is a normal part of the examination although you may feel some discomfort. Gonioscopy is usually performed in the dark, when the pupil is naturally dilated to its fullest and the drainage angle is at its narrowest. The picture on the left shows gonioscopy being performed with a goniolens. The picture on the right shows a diagram of how the anterior chamber drainage angle can be seen directly on gonioscopy with a gonioprism. Anterior segment optical coherence tomography (AS-OCT) is a special scan that takes cross-sectional images of the front parts of the eye, including the anterior chamber drainage angle. It is very useful in confirming whether the drainage angle is open or closed in cases which are not so straightforward. In angle closure, the AS-OCT will show the iris pressing against the cornea, thus occluding the drainage angle completely. AS-OCT is usually performed in the dark, when the pupil is naturally dilated to its fullest and the drainage angle is at its narrowest. AS-OCT scans showing open angles (A; left) and angle closure / closed angles (B; right). The difference between the 2 are very apparent with AS-OCT.